Businesses that serve homeowners & companies with services such as cleaning, lawn care, pest control, handyman services, contractors are often challenged to make sure homeowners and employees alike are keeping scheduled appointments. This is especially the case if access to the home or business premises is required. 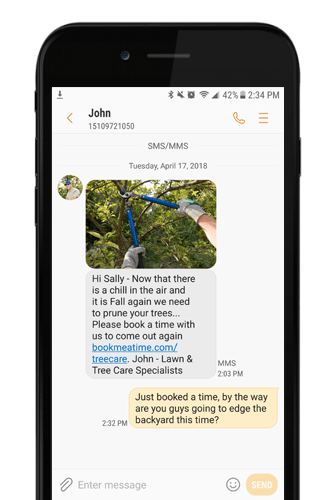 Textellent can send text messages allowing clients to schedule appointments via their phone at their convenience and they will automatically receive text reminders prior to the appointments. Afterward, Textellent can send confirmation of services completed, thank you notes and even referral requests based on services rendered. Many services are recurring in nature. Textellent can make automatic follow up to invite re-booking based on the last appointment date. All of these campaigns lead to higher customer retention and more referrals.